The United Nation’s Office on Drugs and Crime (UNODC) released its annual World Drug Report today. There are not a lot of surprises for Central Asia watchers, but the study is a good reminder of just how entrenched Afghan narcotics are in the region. Afghanistan remains the world’s largest producer of illicit opiates, accounting for 74 percent of global production in 2012. Those narcotics continue to pass relatively unhindered from Afghanistan through Central Asia for markets in Russia and Eastern Europe. On the way, they wreck havoc, as increasing numbers of Central Asians succumb to heroin addiction and HIV. What’s being done? The striking chart to the right shows how, over the past ten years, interdiction in the region has actually fallen, especially in Tajikistan (shown in pink). Over the same period, Afghan drug production generally increased (with the exception of 2012, when, due to adverse weather and disease, production fell by 36 percent). “A preliminary assessment of opium poppy cultivation trends in Afghanistan in 2013 revealed that such cultivation is likely to increase in the main opium growing regions, which would be the third consecutive increase since 2010,” the report says. 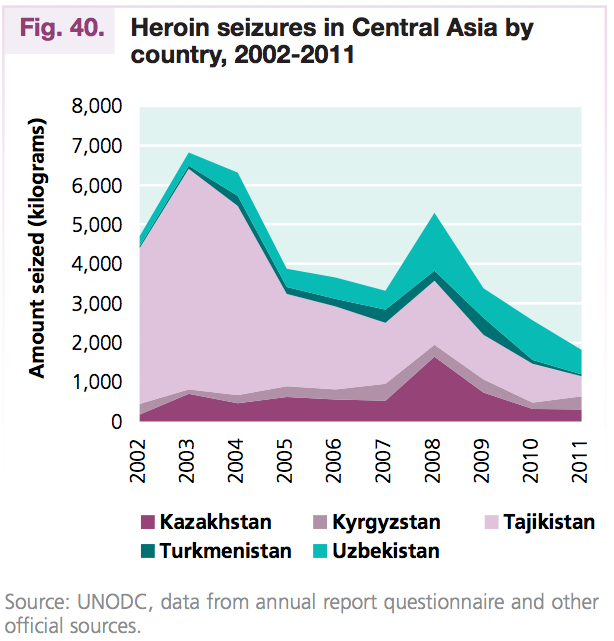 Overall, heroin seizures in Central Asia have been declining since the first decade of the twenty-first century, from an annual average of 5 tons per year during the period 2002-2006 to only 3 tons during the period 2007-2011, while demand in Central Asia and the Russian Federation is thought to be stable or increasing. The small peak in seizures in 2008 seems to reflect the high opium production in Afghanistan in that and the preceding year but did not change the overall declining trend. The link between production in Afghanistan and seizure levels in Central Asia is not evident and other factors are assumed to have played a role. Researchers including David Lewis have convincingly argued that those “other factors” include drug traffickers with protection at some of the highest levels of government in weak states like Kyrgyzstan and Tajikistan. UNODC leaves open other possibilities, too, noting that traffickers are “increasingly looking for new routes to supplement the old ones.” That might explain the growing role of eastern Africa in the trade, which is seeing increasing seizures and a marked rise in opiate abuse in coastal regions, the UNODC says. But the social impact of heroin in Central Asia and Russia makes it clear an awful lot of narcotics still pass through the region. Between 2008 and 2011, Russia saw an increase in over 500,000 adult injecting drug users (mostly heroin), to 2.3 percent of the adult population, says the report. There, 21 percent of injecting drug users are HIV positive. Central Asia has an injecting drug rate four times the global average, at 1.3 percent. In Kyrgyzstan, 15 percent of the prison population lives with HIV. Against the backdrop of these grim statistics, Central Asian officials can reap some mild relief from the report’s finding that “new psychoactive substances” – a disturbing trend in synthetic drug use that is particularly hard to police – haven’t got a foothold in the region.